other sources of dairy products consumed by humans. Dairy products are commonly found in European, Middle Eastern and Indian cuisine, whereas aside from Mongolian cuisine they are little known in traditional East Asian cuisine. Churning is the process of shaking up cream (or whole milk) to make butter, and various forms of butter churn have been used for the purpose. In Europe from the Middle Ages until the Industrial Revolution, this was generally as simple as a barrel with a plunger in it, which was moved by hand. Afterward, mechanical means of churning were usually substituted. Butter is essentially the fat of milk. It is usually made from sweet cream. In the USA, Ireland and the UK, salt is usually added to it. 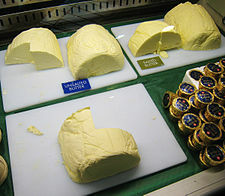 Unsalted (sweet) butters are most commonly used in the rest of Europe. However, it can also be made from acidulated or bacteriologically soured cream. Well into the 19th century butter was still made from cream that had been allowed to stand and sour naturally. The cream was then skimmed from the top of the milk and poured into a wooden tub. Buttermaking was done by hand in butter churns. The natural souring process is, however, a very sensitive one and infection by foreign microorganisms often spoiled the result. Today's commercial buttermaking is a product of the knowledge and experience gained over the years in such matters as hygiene, bacterial acidifying and heat treatment, as well as the rapid technical development that has led to the advanced machinery now used. The commercial cream separator was introduced at the end of the 19th century, the continuous churn had been commercialized by the middle of the 20th century.